Fashion's finest comes to the West Coast in this stylish, seven-day soiree, featuring new collections by world-renowned designers, Zandra Rhodes and Marc Bouwe, as well as some of the hottest up-and-comers, including Michael Costello and the Stars of Project Runway. Pack your bags and run away to the runway. 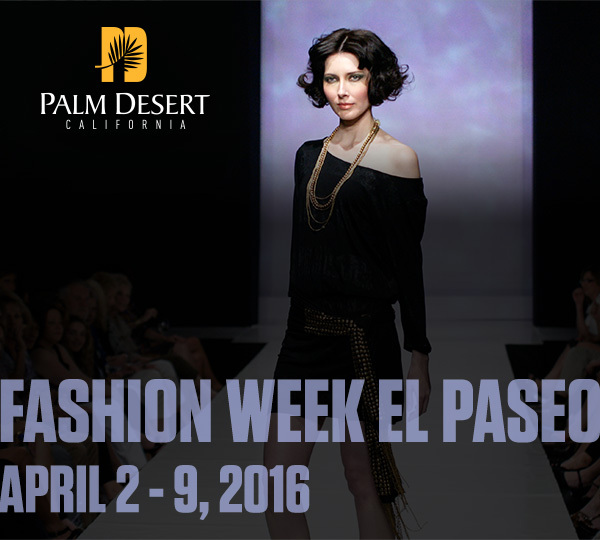 Learn more about Fashion Week El Paseo April 2016. Mark your calendars now, as you will not want to miss the glitz and glamour of the largest fashion show on the West Coast. Fashion Week El Paseo™ 2016 presents runway shows featuring top couture designers such as Monique Lhuillier, Zandra Rhodes, Marc Bouwer, Michael Costello and the Stars of Project Runway, the El Paseo Runway show, FIDM/Fashion Institute of Design & Merchandising graduating student collections, and Le Chien Couture, benefiting the Humane Society of the Desert. Daytime events include exciting trunk shows and more. It all unfolds in Palm Desert. See the fashion designers attending the event.